Entrance and initial reception of guests in the Tarran room; -entry from the Garden/playground area. This is a very attractive ‘Garden Room’ facility with magnificent views of the Cleveland hills. Some people offer a drink on entry here but some go into the Johnson room. The playgound immediately outside this room can be attractive for photographs and for groups with lots of children! The adjacent Johnson Room is often used for the initial assembly of guests; is also used as a ‘quiet room’ (Away from a noisy group in the main hall), a bar area, or somewhere to gather between the main wedding reception and the ‘evening do’. 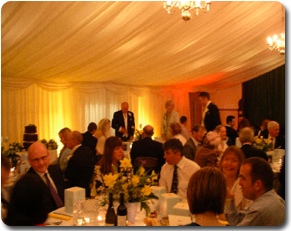 The Main Hall is normally used for both the wedding reception and evening event including dancing; While the room is attractive in itself it can be fitted with a full internal marquee and chandeliers and mirror balls etc . (See photo) The room can accommodate up to 120 seated at tables and up to 100 if a dance area is retained. There is a full stage available and access to sound and light systems. The Leven room has been used as a children’s play room; (even with bouncy castle ! ), as a food assembly or serving area or an overflow from the other rooms. There is a fully equipped kitchen and coffee bar area and a small bar off the main Hall. The Hall is fully equipped with adequate tables and chairs etc. It is normally the hirers responsibility to set up these as they wish but assembly and clear up facilities can be offered by the Hall Manager. under an inclusive wedding weekend tarrif but individual rooms and/or shorter periods can be booked. Click for price details and additional facilities. weddings we accept is limited and therefore early reservation is advisable.